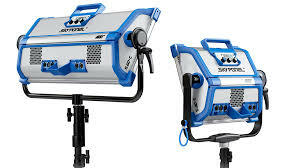 The Skypanel was launched in 2015 as one of the most exciting Arri’s releases. It does not need external ballast: it is included in the rear part of the device. It evenly mixes in a single beam of light red, green, blue and white leds providing with a soft light. This soft light together with the thermoplastic diffuser make a evenly distributed light that shrouds the subjects. Besides, the control panel features a simple interface that makes it very easy to set. It features a DMX input and output so that it can be set from the distance. It does also have CTC or color temperature control between 2800K and 10000K. The average color reproduction index is 95%, being the lowest level 94,7% at 10000K. Furthermore, it offers the possibility of tuning the magenta-green tint over the chosen color. It also features an average TLCI (TV lighting consistency index) of 90%. The Skypanel 60-C has several interchangeable diffusion panels and it can be mounted on a yoke or through its central join. Either set up is relatively light on around 12Kg. Its dimensions are 64.5 x 30cm and it is one of the best options for either outdoors or indoors. This new feature breaks the pro lighting rules forever, offering different lighting effects presets without using neither a light console nor hours of programming. The different effects (candlelights, clouds passing by, club lights, police lights, fire, paparazzi,...) have different programmable variables that can be adjusted for different purposes (i.e, police lights colors, number of paparazzi shooting,...). Besides, they include random rendering patterns that add extra realism making each bonfire or paparazzi effect different than the previous ones. The Skypanel calibrated lighting engine offers virtually any color, but with the new update it adds new lighting presets that quickly match other light sources (tungsten, fluorescence, candles,...). This way it is easier and faster to match a given location lighting withour having to modify each parameter (color temperature, saturation,...) but just selecting an option from the list. With the latest update it is possible to record at almost any framerate or shutter angle: the devices have gone through several tests with up to 25K fps and 2º shutter angles without image quality issues. The flickering has been at last fully removed. The sACN system has been also integrated and now it is possible to communicate with lighting consoles via ethernet conections. Besides, the Skypanel automatically detects whether an Art-Net or sACN signal is being received and it reacts changing the required settings by his own.